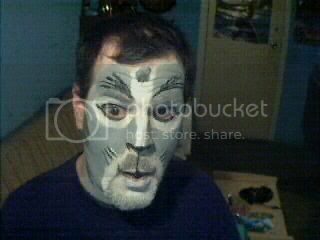 Back when I was a regular member of the CCDB (Cats Costuming Discussion Board) I would occasionally take part in their monthly makeup challenges. This theme was try out another member's OC design. (OC stands for original character). The member, KCR had a character called 'Gray Cat' and I gave it shot. Here he is with his original design.